Roughly two thousand U.S. Army soldiers were filmed singing praises to Jesus Christ as part of their Easter celebrations. The footage was taken at Doughboy Stadium at Fort Benning, Georgia, as crowds of military personnel sang the worship song, “Reckless Love” by Cory Asbury. 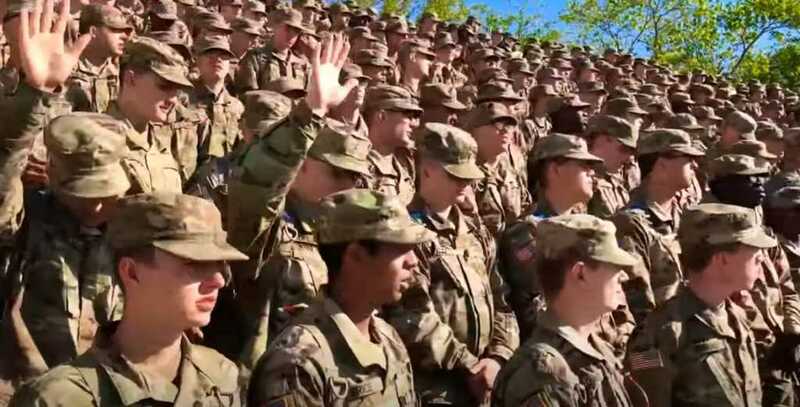 “It was a fabulous day at Doughboy Stadium on Fort Benning as roughly 2,000 Army #Soldiers gathered together to celebrate the resurrection of Jesus Christ,” wrote Jenny Reese Clark, who posted the video to YouTube. Clark detailed how the Holy Spirit moved during the worship, prompting some to give their lives to Jesus for the first time. “As the words of the song ‘Reckless Love’ by Cory Asbury were sang, the Holy Spirit moved among the crowd not just encouraging the men and women present, but causing some to give their hearts to #Jesus for the very first time. #Hallelujah!” she added. “There is nothing like ‘the overwhelming, never-ending, reckless LOVE of GOD! '” she wrote. “Awesome! The Word is spreading! Soon, it will cover ALL the earth! Glory!! !” one person commented on the event. “Wow this gave me goosebumps to watch. So awesome! Praise God!” another added. Another attendee took to Instagram to report that some 225 soldiers “gave their hearts to Jesus” at the April 1 service. Amen. Congratulations to all who made the life-changing decision to follow Jesus this Easter.